The nicotine in cigarette smoke leaves behind a yellow residue that stains walls and windows. If not kept in check, this residue can build up over time, making it difficult to remove. Even more important than unsightly yellow stains is the health hazard presented by nicotine buildup on walls, which is often referred to as "thirdhand smoke" by medical professionals. Nicotine is a toxic and addictive substance that's found in tobacco smoke. Though it's colorless and not easily distinguished in the smoke itself, it leaves behind an oily, yellow residue. When a person smokes indoors, the cigarette smoke eventually dissipates, leaving behind the greasy residue. The residue can stain clothes, teeth and even walls and furniture. The stains aren't noticeable at first, but over time they build up, causing an unsightly yellow area on walls. It's especially noticeable in places where a smoker is known to sit, such as by a favorite comfy chair or a place at the kitchen table. 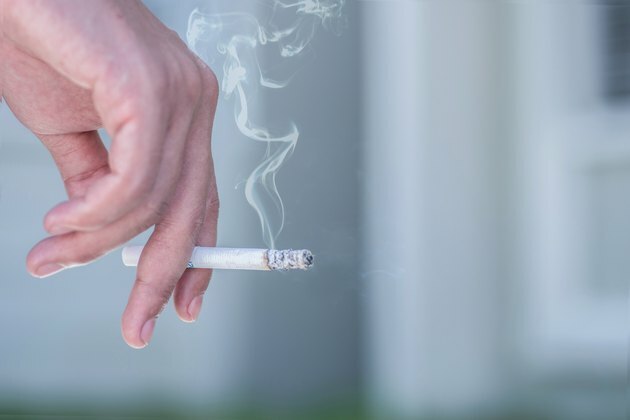 As the smell in a heavy smoker's home can linger for months after the smoking stops, it can be difficult to completely remove nicotine from walls. For a chemical-free approach, the best cleaner for nicotine on walls is a solution of half vinegar and half water. In addition to cleaning nicotine stains, the vinegar can also help to neutralize the lingering odor. Spray the vinegar solution directly on the stain and let it sit for several seconds before wiping it clean with a damp cloth. It can take several applications before the stain is completely removed. The best cleaner for nicotine on walls from a commercial standpoint is a product containing trisodium phosphate, or TSP. TSP is a general-purpose cleaner found in most home improvement stores. Before cleaning the wall, put a tarp down on the floor to protect it from drips. It's also a good idea to don cleaning gloves, as TSP can irritate the skin. To remove nicotine from walls, follow the directions on the label for the proper amount of water to cleaner ratio. Dip a sponge or scrub brush in the cleaning solution and wipe or scrub until the stain disappears. It may take several passes for stains that are building up over time. Rinse the sponge in clean water and wipe the area clean of the cleanser. It may not be possible to remove nicotine from walls that are too far gone, and repainting may be necessary. Because tar and nicotine will leach through paint, it's best to first paint the walls with KILZ primer to neutralize the odor and cover the stain. People who smoke in the car might find greasy nicotine stains on their windshield. In addition to thirdhand smoke, nicotine on car windshields can cause a haze on the glass, making it harder to see at night. To clean cigarette smoke from car windows, first clean the windshield with a commercial glass or window cleaner. Spray the cleaner onto the stained area and let it sit for a few minutes. Work the cleaning product on the windshield with a scouring sponge or soft brush. Avoid using an abrasive scrubber that can scratch the window. Remove the soap from the windshield with a clean, damp sponge dipped in warm water and dry it with a microfiber cloth. Repeat the process as often as needed until the windshield is clean of nicotine.